Mutant Football League is a football game that aims to bring a more violent, mature tone to the sport. I had the chance to play the title along with another mxdwn member, Yammarii. Before we started playing, we were given a choice of teams to choose from. Each team is unique in that there is a mechanic called “Dirty Tricks”. These moves allow you to essentially cheat, and each team determines what kind of dirty tricks you can use. Once we had our teams picked, we had the usual kickoff. The biggest twist with this game is that all players have health bars, and at all points in the game, you can attack opposing players in order to take them out of the game permanently. Also, there were all-star players that could have the most impact in the game, and once they are out, they are out for good. To add to the intensity of losing a player, various field hazards would risk any player instantly losing a unit in a split second. The addition of these hazard really added an interesting flow to the game. 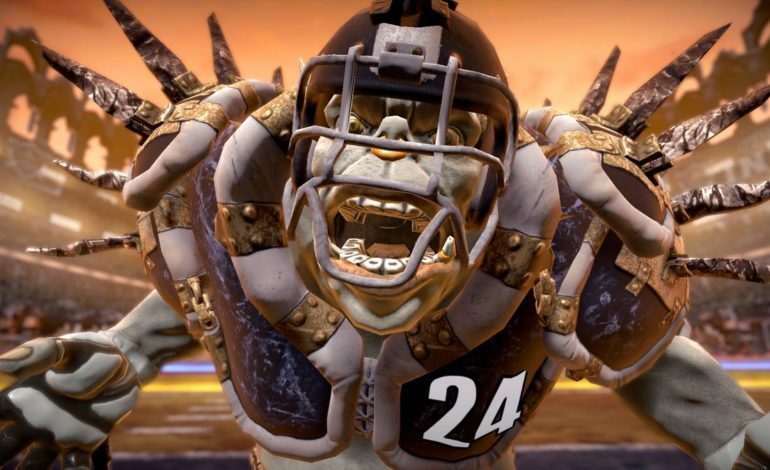 At its core, Mutant Football League is still a football game. You still choose your plays, you can snap the ball, pass it, run it, score field goals, and so on. We started off going back and forth, preventing each other from scoring a touchdown. As we played along, we would use dirty tricks on each other. I would bribe the ref so the touchdown Yammarii just got didn’t count, so the touchdown didn’t count and he got a penalty. Yammarii then killed the ref so that he would no longer get penalized, but it also cost him a turn. As we continued on, our players would take a second to banter to the other team. As their dialogue was put up on the screen, it would also show that individual player’s stats for the game, which was a cool little touch. At halftime, neither of us had scored on each other, but we were now invited to play a mini-game which involved killing as many zombie refs as possible. There is no reward for winning, but you do get bragging rights, and it is a nice little break from the game. Once halftime was done, we went right back at it, blocking passes, using dirty tricks, and trying to inch closer to the touchdown zone. Yammarii ended up making two great plays that put him up by 8 points. In the end, those plays won him the game. Unfortunately, I am not a football fan, so I was somewhat lost with the gameplay, but there is a lot of character and humor in this game. The world created around Mutant Football League is rife with jokes and hilarious, over the top insults. Despite having no idea what I was doing, I still enjoyed it. Also, the voice actor behind the announcer and the characters, Tim Kitzrow, did an absolutely phenomenal job. While Mutant Football League is already available for digital download, there will be a physical release sometime later in late Summer or early Fall of this year with the Nintendo Switch version coming as well. The physical release will also come with a patch that will update player rosters and add more hilarious and downright evil dirty tricks to every team’s arsenal.